With that long experience, Gizi, a once popular product now appears again with their newest set of skin and face treatment called Secret of Seaweed. People at Gizi Skin Care are kind enough to send me a set of Gizi Secret of Seaweed few weeks ago. And now, I shall give my overall insights of these products. Each of the products on the Gizi Secret of Seaweed series carries the 4H. Herbal >> Each Gizi Secret of Seaweed products is made of 7 natural ingredients (5 for the daily natural lightening foam). The main ingredient is, of course, seaweed. Others are rice, bligo, soy bean, aloe vera, lime, and papaya. Hitech >> All of the products use nano technology that makes the beads so soft and super small, ensuring it gets into the skin perfectly and absorbed well. 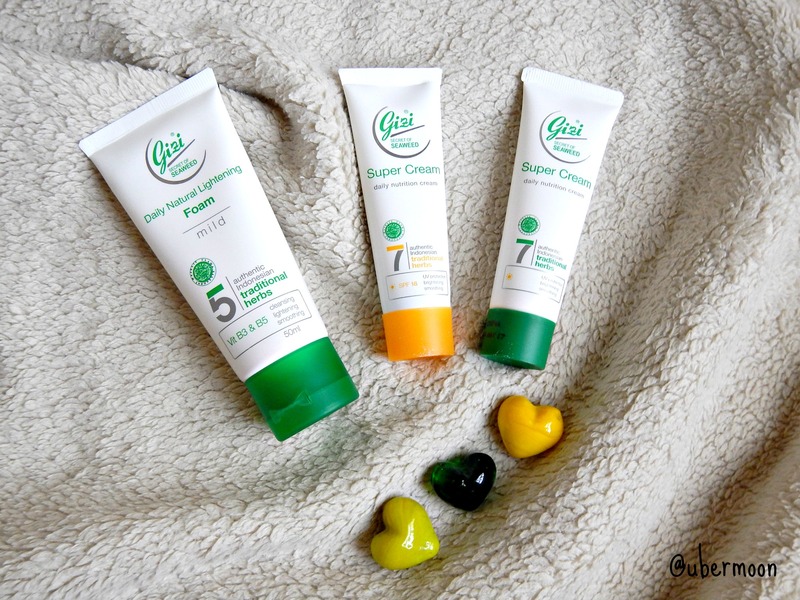 I got three products of Gizi Secret of Seaweed; two Gizi Secret of Seaweed Super Creams (one with SPF and one without) and one Gizi Secret of Seaweed Daily Natural Lightening Foam. So basically, they are daily nutrition cream (moisturizer++) and facial foam. Honestly, I rarely put moisturizer before starting my make up routine. It’s because I feel like my foundation moisturizes my skin already, but, I have always put moisturizer before my sleep. With two daily nutrition creams I got from Gizi Skin Care, I now change my routine. I use Gizi Secret of Seaweed Daily Nutrition Cream with SPF in the morning before my make up, and then use the Gizi Secret of Seaweed Daily Nutrition Cream without SPF before I go to bed. Does it make any difference? Turns out, it does!! My bare skin feels softer after I use the creams daily. Particularly my cheek skin becomes supple and toned. And the use of the cream before the make up holds my make up for a more longer time! Other than that, both creams doesn’t leave my skin oily and it doesn’t make me feel hot like several moisturizing cream in the market do. Winning! First impression: the bead is so soft and the smell is soothing! I super super love the smell of this Gizi Secret of Seaweed Daily Natural Lightening Foam. It’s a combination of fresh aloe vera smell with a hint of seaweed and lime. Super refreshig and relaxing! I started using this facial foam halfway of my Saga Trip (I did a saga trip of Yangon – Ternate – Kota Kinabalu – Bogor back to back this August; I’ll post stories about the trip later on) and although Gizi Secret of Seaweed Daily Natural Lightening Foam claims to lighten the skin, I barely see the difference. Most likely cus I snorkeled like crazy in the middle of the day in Ternate for hours. Hihihi. I realize, though, that my face doesn’t get super tan unlike my arms. So maybe this daily natural lightening foam actually works well – or I believe it’s the Gizi Secret of Seaweed Daily Nutrition Cream who protected my skin. 😛 One plus point for this Gizi Secret of Seaweed Daily Natural Lightening Foam is it doesn’t make my skin feels dry. Usually, after I wash my face with a facial foam, I feel like some parts of my face is dry, like in both ends of my lips and around my nose, but with this foam, I don’t feel the dryness! In conclusion, I’m really happy with this set of Gizi Secret of Seaweed I got. The daily nutrition cream works really well for me and the smell of the daily natural lightening foam is just ah-mazing! *I’m pressing the tube now so the smell roars again as I type this* Hihihi. I’m getting to a flawless skin with Gizi Secret of Seaweed!